I have partnered with SheWill.org and YoungFinances.com to host the Preschool to Parenting Financial Summit for girls (ages 12-18), young adult women and mothers on Saturday, April 27th at Ivy Preparatory Academy in Norcross, GA. We will be working with the girls on managing their money, career empowerment and even investing at their age. Each participant will leave the summit with a new attitude about money and the fundamental skills necessary to become successful. Register by April 15th to be entered to win an iPad mini! The Preschool to Parenting Financial Summit is due to the collaborative efforts of three dedicated women in the financial literacy community, Sheena Williams from SheWill.org, Latisha Styles from YoungFinances.com and me, Pam Whitlock from MoneyTrail.net. 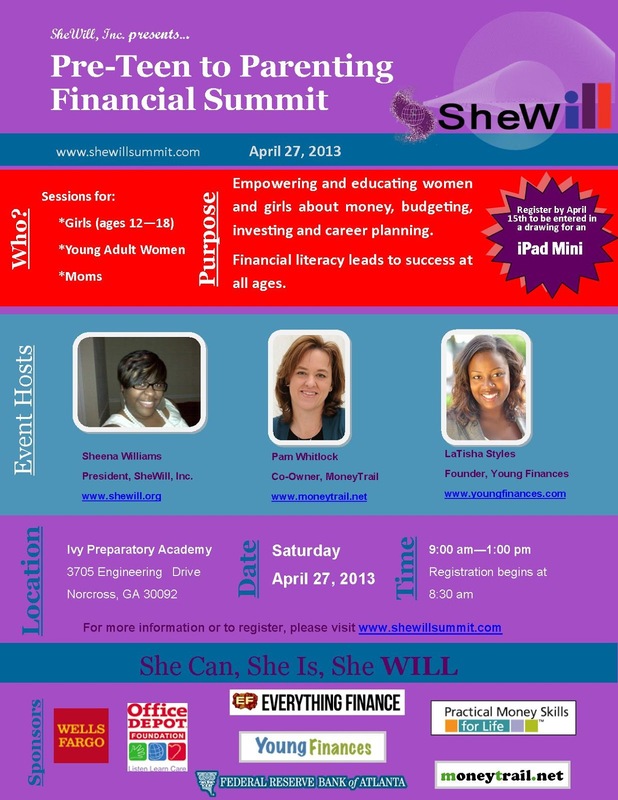 Sheena is the founder and president of SheWill, Inc., 501(c) (3) tax-exempt organization created to educate young girls, between the ages of 8 and 17, on the importance of financial literacy and career empowerment. LaTisha is the founder of Young Finances, a website that specializes in investing with young adults. I am the co-owner (along with my husband) of MoneyTrail.net, an allowance and money management system for kids, teens and families. We are all in the Atlanta area and are passionate about preparing young girls for successful, career oriented futures free from debt and irresponsible financial decisions. The event will be held from 9:00 am - 1:00 pm and will include a light breakfast and lunch for each participant. For more information or to register for the event, please visit www.shewillsummit.com.